Sometimes I get lucky. Walking along the washes between the Temple of the Moon and Temple of the Sun in Capitol Reef, I looked east and saw a full moon rising over the horizon. I positioned myself west of the Temple of the Moon. I waited over an hour for the sky to darken and the moon to rise above the temple monolith. While waiting, I thought about the spiritual ramifications that were felt by the ancient native Americans thousands of years ago. It was well worth the wait. 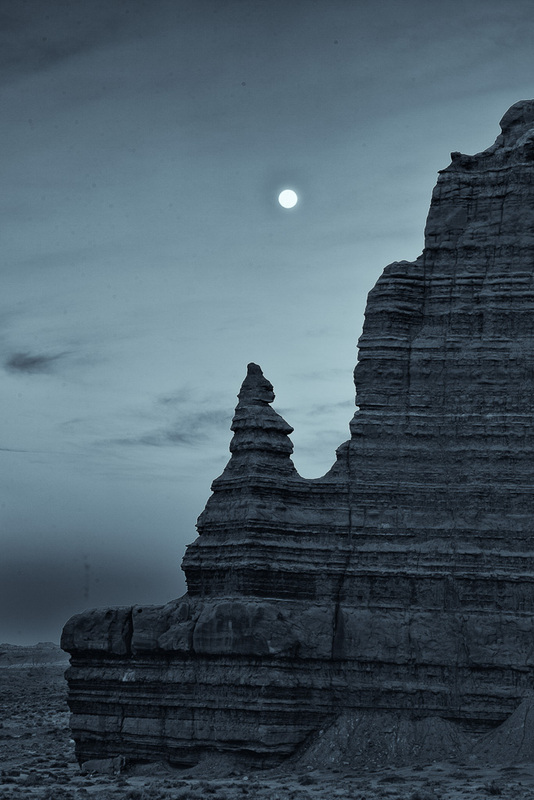 This entry was posted in B&W Photography, Geology, The Grand Landscape and tagged Capitol Reef, moon, Temple of the Moon, Utah on March 28, 2019 by kgrafphoto.